SIS alumna Katrina Velasquez wanted to combat both the stigma and the mental illness itself. And in 2016, as a lobbyist, she achieved something historic: successfully advocating for the passage of the first-ever eating disorders legislation. The piece of legislation is entitled the Anna Westin Act of 2015, and its key provisions were passed within the 21st Century Cures Act (P.L. 114-225). Thanks to the passage, health professionals receive training to identify the early signs and symptoms of eating disorders. Additionally, as a result, the Office on Women’s Health provides updated resources to help the general public identify and understand eating disorders. The legislation also improves health insurance coverage for eating disorders, so there’s greater access to various treatment options. Velasquez advocates for a handful of social causes including school safety, women’s health, mental health, people with disabilities, and military and veterans’ issues. She was particularly drawn to working on the issue of eating disorders because she witnessed how they took hold of her friends and members of her family. “Lobbyist” isn’t always seen as a favorable word. In fact, Washingtonians often associate lobbyists with corporate interests, big business, and the phrase “money talks.” But Velasquez represents the side of the profession that advocates for social progress. Velasquez’s time at SIS inspired her to become what she calls a good lobbyist, the kind of advocate who strives to make a positive impact. 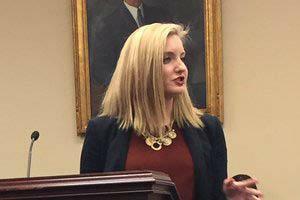 While working on Capitol Hill and with nonprofit organizations, she realized that lobbyists could make immediate changes, both on the international and domestic sides of politics.